Pacific Rim fans will know that setting any piece of tie-in material before the events of the movie usually can only end up one way: with most of its protagonists and their lovely giant robots dead, leaving Humanity’s defenders on the brink in time for the movie. The new Pacific Rim comic knows that too, and uses it to brilliant effect. 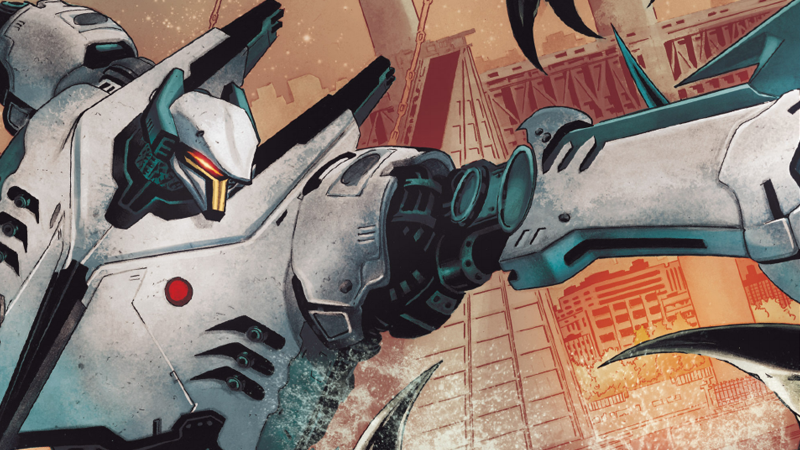 Spoilers ahead for Pacific Rim: Tales from the Drift #1, by Joshua Fialkov, Travis Beacham, Marcos Marz and Marcelo Maiolo. Tales from the Drift tells the story of the pilots of Tacit Ronin—the immensely cool-looking Japanese Jaeger shown for about 3 seconds a most in the opening sequence of the movie—but it doesn’t tell the story of how they lived, and triumphed over the Kaiju threat. It instead tells the story of how they died, and flashes back through Pacific Rim’s neural linkage system, the Drift, that binds the two pilots of a Jaeger together, to tell you about their history. In Tacit Ronin’s case, this is the husband-and-wife team of Kaori and Duc, who are put in a fatal position when their Jaeger reactor is damaged by an attacking Kaiju, filling their command pod with lethal doses of radiation and slowly killing them. It’s an interesting decision to set an entire comic in the moment of someone’s death—let alone people you’ve never heard of before, even if you’re a Pacific Rim fan. It’s surprisingly human for a comic adapting a movie that was more about giant robots punching things than it was its human cast. It tinges everything you see with a sense of sadness and inevitability, as Kaori and Duc fall, rally, and fall as they try to do their jobs as Jaeger pilots even as the world darkens around them. But what makes Tales from the Drift interesting is that it intersperses this death scene with a flashback to how Kaori and Duc first met, and uses the medium of comics to fantastic effect to do so. To represent the idea of the Drift being a shared experience between people, panels are placed side-by-side retelling Kaori and Duc’s separate sides of the meeting—where Duc, a U.S. Navy captain, attempts to save the life of Kaori and a submarine full of researchers from a Kaiju breach. It’s very clever, and a great way to represent a sort of “life flashing through your eyes” story in comics that doesn’t just make sense for the Pacific Rim universe. But it manages to tell a surprisingly sad and compelling story, to the point you almost forget that there’s a giant-robot-versus-giant-monster fight happening all around it. The brief moments of sweet Kaiju/Jaeger action that punctuate the backstory are wonderfully dynamic—Marz’s art is clean and wonderfully framed that makes the fight scene joyful to watch, even if it’s more of a total wreck for poor Tacit. It’ll be interesting to see where the series goes from here—it leaves Tacit and its crew still in some pretty dire straights, but not quite down and out—but so far, it’s a pretty engaging sojourn into the history of Pacific Rim.